Toss the bicycles in through the rear bike door, load up your clothing and some food, then simply hitch up and go! 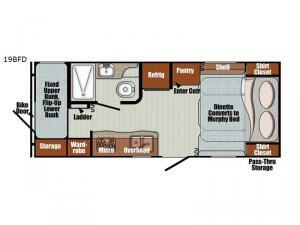 This Vista Cruiser offers sleeping for four with a set of bunks that the kids are sure to love. Mom and dad have the convenience of a Murphy bed up front that they don't even need to make up each morning, just fold it into the wall and voila, a family dinette appears beneath. With the bike door storage beneath the bottom fold up bunk, a front pass-through compartment outside, and all the convenient places inside to tuck things away like in the bunk cubbies, the wardrobe, the pantry space, plus overhead cabinets, this unit has a space for just about everything you may need to store! All Vista Cruiser travel trailers were built to provide you with a lightweight choice featuring storage throughout, spacious interiors, aerodynamics for great on-road performance and fuel savings, and the ability to use your current SUV, mini-van, or similar tow vehicle. On the inside, you will enjoy the advanced Euro-style interior design, a full dry bath, and two attractive decor choices. Not to mention, each Vista Cruiser features multiple USB charging ports both inside and out so you can keep all of your electronics fully charged. 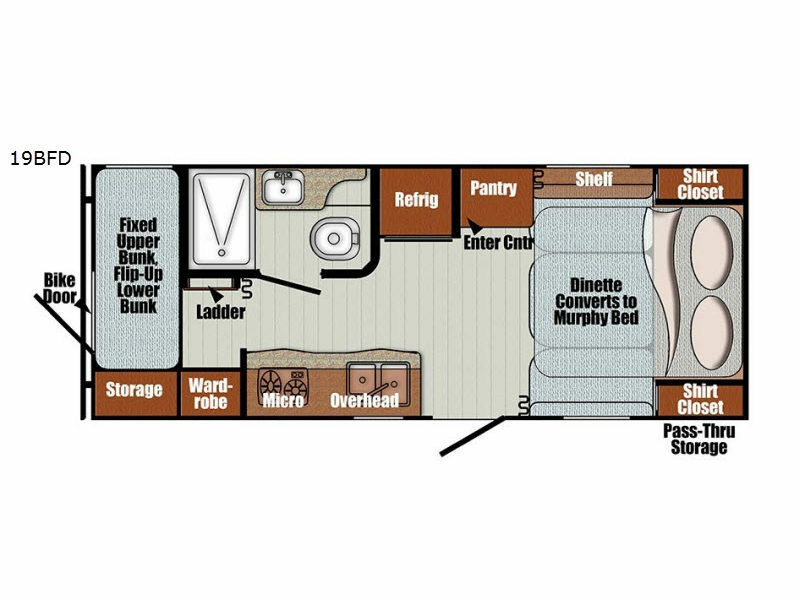 For a lightweight and eco-friendly travel trailer that will provide years of enjoyment, take a look at any Gulf Stream Vista Cruiser today!